Richard Baxter was born in Shropshire in 1615 and educated in the local schools. He was ordained in 1638 and spent the early years of his ministry as a schoolmaster and curate, becoming a chaplain to the parliamentary army at the outbreak of the English Civil War in 1642. Although aligned with the Puritan cause, Baxter was a moderate and stood against the excessive destructiveness of Cromwell’s legions. In 1647, Baxter became the Vicar of Kidderminster. It was there that his pastoral ministry thrived. He set up new patterns for parish catechesis, increased the size of parish buildings to welcome the larger numbers coming to hear him preach, and pioneered a style of pastoral ministry that has enriched the Anglican tradition to this day. Baxter provides his own narrative of his pastoral work in his book The Reformed Pastor, of 1656. When episcopacy was re-established in England after the Civil War, Charles II offered Baxter an appointment to the see of Hereford. Although more moderate than many, Baxter’s Puritan convictions kept him from accepting the post, a decision that made it impossible for him to continue as a priest of the Church of England. Baxter is remembered in the history of the Book of Common Prayer for the role he played at the Savoy Conference of 1661. There he argued for the changes that needed to be made in the next prayer book from the vantage point of the Puritans, the so-called “Exceptions.”The resulting 1662 Prayer Book shows few of the marks of Baxter’s agenda, but his strong advocacy of the Puritan position certainly influenced the shape of the revision. From 1662 until his death in 1691, Baxter resided in the environs of London. The re-establishment of the monarchy in the state and episcopacy in the church unfortunately made Baxter, remembered for his moderate Puritan posture, a target of unkindness and petty revenge. A profound example of Baxter’s deep joy and piety can be found in the words of the hymn Ye holy angels bright (The Hymnal 1982, #625). 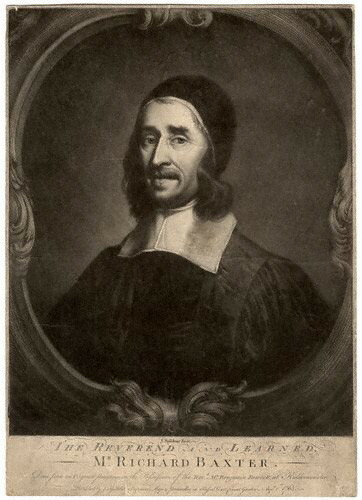 I We offer thanks, most gracious God, for the devoted witness of Richard Baxter, who out of love for thee followed his conscience at cost to himself, and at all times rejoiced to sing thy praises in word and deed; and we pray that our lives, like his, may be well-tuned to sing the songs of love, and all our days be filled with praise of Jesus Christ our Lord; who with thee and the Holy Spirit liveth and reigneth, one God, now and for ever. Amen. II We give you thanks, most gracious God, for the devoted witness of Richard Baxter, who out of love for you followed his conscience at cost to himself, and at all times rejoiced to sing your praises in word and deed; and we pray that our lives, like his, may be well-tuned to sing the songs of love, and all our days be filled with praise of Jesus Christ our Lord; who with you and the Holy Spirit lives and reigns, one God, now and for ever. Amen. Title. In the printed edition of HWHM the margin spacing on the page is off (same as yesterday’s). Psalm: Once again some verses (14-18) are left out? 12 verses of the Psalm were just too long? Collect: Pastor Baxter’s prose from The Hymnal 1982 # 625 appears too much in this collect. It is as if he wrote his own collect. Bio. He needs a ‘who he is’ and ‘why he is important’ statement. 1st paragraph: Could we add Shropshire, England? Regarding paragraph five I have to ask, was it literally “the re-establishment of the monarchy in the state and episcopacy in the church” that made Baxter “a target of unkindness and petty revenge,” or was it his Puritan views, combined with pettiness and vengefulness in his adversaries, that made him such a target? I seriously doubt that the sentence, as worded, is literally correct. I’m glad to see the hymn number listed. In the collect the phrase, “at cost to himself” seems to need an adjective (great cost, considerable cost, personal cost – MSRP, something). On the other hand, there’s an awful lot of embellishment going on with “rejoiced to sing your praises in word and deed” (which could simply be “rejoiced to sing your praise”), and even more embellishment in the “and we pray” segment of the petition. The collect lacks the traditional “so that…” clause, although I suppose the request to be filled with the praise of Jesus can be construed as a “so that” clause, even if it doesn’t say it that way. Another point about the collect, it revolves around his self-differentiation as a puritan, and his devotion (expressed in musical imagery), but the collect unfortunately ignores both his pastoral contributions and his extremely important opposition to violence (“excessive destructiveness of Cromwell’s legions”). These seem too important to lose track of and ignore in the collect. The Psalm selection seems weak, not especially germane to the context of the commemoration, and difficult to announce because of the start/stop/skip/start/stop pattern of the verses (102:11-13,19-22). I’d prefer 71:18-24, which has musical imagery (vv. 22-24), speaks of challenges and difficulties encountered (v. 18a, 20), praises God (v.19 and most other verses), and affirms God’s help and support through the adversity (vv.18-24). It’s perfect for this commemoration and easier to announce! I don’t understand the choice of the 10 Commandments as the Old Testament lesson, either. (Is the implication that Puritans are virtuous and obey them, but Royalists are lax and don’t?) The epistle is fine (run so you may win the imperishable wreath). The Gospel reading (the Lord’s Prayer, Matthew 6) is obviously an edifying and profound selection, but again, I don’t have a lot of confidence a connection with the commemoration will be easily grasped. PS – Considering the gratuitous elaborations in the collect (see above), the puritan motif of the commemoration in general, and the gospel’s verse 7, (“When you are praying, do not heap up empty phrases as the Gentiles do; for they think that they will be heard because of their many words”) a more economically worded collect might be an absolute necessity. ‘A decision that made it impossible for him to continue as a priest of the Church of England’—this is not correct. Then as now, refusing a bishopric (he also refused a Scottish bishopric some years later) did not mean deposition from the priesthood. However, no one could be appointed as vicar or rector of a parish, under the Act of Uniformity of 1662, unless they agreed to principles that had not been required of clergy prior to this act, and Baxter refused to agree to this narrowing of the breadth of the church. He resigned his parish, and spent the rest of his life campaigning for a church broad enough to accept all the traditions that had become part of it by the mid-17th century. The primary reason why I would support his commemoration by the Episcopal Church today is because of his dedication to the principle of a theologically inclusive church. The biggest bone of contention in 1662 was the episcopate; most English presbyterians were not against episcopal government, but thought presbyters should have a formal role in it. The Episcopal Church was the first to give presbyters such a role, and most of those unable to continue in ministry under the terms of the 1662 act would have been able to do so under the Constitution and Canons of the Episcopal Church. Baxter was the first to use the phrase “mere Christianity”, and argued that since mere Christianity (understood as the Apostles’ Creed as the standard of belief, the Ten Commandments as the standard of behavior, and the Lord’s Prayer as the standard of worship) is all that is required for baptism, nothing more need be required for ordination except the education and skills necessary for the clerical role, and the willingness to conform to the canons of the church. Baxter described himself as being “for Catholicism against all Sects; to shew the Sin and Folly and Mischief of all Sects that would appropriate the Church to themselves, and trouble the World with the Question, Which of all these Parties is the Church? as if they knew not that the Catholick Church is that which containeth all the Parts, though some more pure, and some less”. I’d love to see the collect include some reference to the unity and breadth of the church, in support of which Baxter wrote book after book—Catholick unity, The true Catholick, and Catholick church described, The cure of church-divisions, A defence of the principles of love, which are necessary to the unity and concord of Christians, Catholick theologie plain, pure, peaceable, Catholick communion defended against both extreams, Church concord, and others. That is a whole perspective not included in the write-up, Philip. Thank you for adding it. One of your comments may also explain the choice of the Decalogue as OT and Lord’s Prayer as Gospel lesson, although the phrase “mere Christianity” leaves me wondering if there’s “a page two” to the story. It would be worth reading his biography. Thanks again! Had I read Phillip’s piece before church this evening, I would have used the lessons for Richard Baxter rather than Wednesday in the Second Week of Avdent. Still, I am not sure we need to commemorate Baxter. I would love to hear more from those who asked for his inclusion in the first place. Is he being commemorated already in a diocese? The current write-up in HWHM is a masterpiece! It’s really difficult to summarize Baxter’s life without making it obvious that he deserves commemoration, but HWHM has done it. Having read it, my first inclination was to suggest that HWHM already honors too many apostate Anglicans and not enough loyal ones. Philip’s comment above, however, drove me to google, and the realization that Baxter’s inclusion is not only justified but mandatory. Baxter attributed the Latin original of “unity in things necessary” to Rupertus Meldenius, but it seems Baxter was the first English author to use it. The same thought appears several other times in his writings. ‘Too many apostate Anglicans’—according to his autobiography, Baxter attended and received Communion in the Church of England throughout his life (at least up to the time he compiled it, which was only a few years before his death). He preached elsewhere, but made a point of doing so at times that did not conflict with the services at the parish church. My complaint wasn’t that Baxter was an apostate (although he did eventually register himself as a “mere Nonconformist”), but that the HWHM write-up makes it all too easy to assume he was little more than that. Could we not have an optional commemoration also on December 8th for the historic feast of the Conception of the Blessed Virgin Mary like other provinces of the Anglican Communion? I believe we have room for a “moderate puritan” in our Calendar, and the selection has already been made, but I have some disappointment in the number of additional names from England’s past. I do not mean to belittle the choice of Baxter in any way. I know these were good people, but I prefer the new international and ecumenical choices, especially from the past century. I believe that the subtitle should be extended. I suggest “Pastor, Reformer, and Theologian”, or some such. Line 1, first paragraph: substitute “, England,” for “in 1615”. Line 6, first paragraph: substitute “forces” for “legions”. Line 2, fifth paragraph: substitute ” that city” for “London”.